This was a line from a long-running crime-based TV show that I watched a snippet of recently. Although I rarely watch TV, this line captured my attention and touched my soul. Home is something many of us take for granted. But my guess is that those who lost theirs in the recent California wildfires, or those who leave Mexico and line up outside the Door of Hope praying for a better life in the USA. No matter how you define “home,” the common denominators is that it is the place where love grows best. Home is the story of a young boy from a small apartment in a big city who dreams about different places to live. Ultimately he is searching for the true meaning of home and the importance of finding a place in the world and the love that resides there. Home takes children on a journey using their own eyes to visit many different places to live while providing a touching story about the importance of family over all else. Within the pages of this enchanting book, the boy goes out on a colorful adventure to visit many different homes – from a large house in the suburbs to an igloo to a farmhouse – and meets families wherever he goes. The boy enjoys visiting each residence, but at the conclusion of his trip, he comes to a realization. This is a story about the importance of love and family over all else. Author Bailey is also donating 100% of the proceeds from Home to BUILDING FOUNDATIONS AND DREAMS, the charity he founded that strives to assist underserved students of all ages in pursuing their dreams. What better way to get the perspective of a home than from a house itself! And a “tiny house” no less! The adventure begins when an old farmhouse gets salvaged and recycled into Tiny, a snug little house with a big heart — and WHEELS! With the help of Big Truck, Tiny sets off across America to discover if he is still a real home. Tiny makes friends on the road, like Shiny the Airstream, Waverly the houseboat, and Buster the skoolie (a school bus transformed into a home on wheels). After thousands of miles, Tiny discovers that home isn’t a place…it’s a feeling in your heart. The irresistible rhymes and delightfully detailed illustrations in this new classic from the creators of Sun Kisses, Moon Hugs are sure to enchant children – and the book’s gentle messages about sustainable living and working together will delight parents and teachers as well. Step into unique homes from around the world and discover the many fascinating ways in which people live and have lived. If you lived in the mountains of southern Spain, your bedroom might be carved out of a mountain. If you lived in a village in South Africa, the outside of your house might tell the story of your family. And if you lived in a floating greenhouse in the Netherlands, you could rotate your house to watch both the sunrise and sunset. With intricate bas-relief collages, Giles Laroche uncovers the reason why each home was constructed the way in which it was, then lets us imagine what it would be like to live in homes so different from our own. Showing the tremendous variety of dwellings worldwide log cabins, houses on stilts, cave dwellings, boathouses, and yurts, this book addresses why each house is built the way that it is. Two Homes is a sweet picture book with clear, matter-of-fact language and sweet watercolor illustrations show all the good things about having two homes (two favorite chairs, two sets of toys) and, more importantly, reassure young readers that each parent always loves them no matter where they live. At Mommy’s house, Alex has a soft chair. At Daddy’s house, Alex has a rocking chair. In each home, Alex also has a special bedroom and lots of friends to play with. But whether Alex is with Mommy or with Daddy, one thing always stays the same – Alex is loved. The gently reassuring text focuses on what is gained rather than what is lost when parents divorce, while the sensitive illustrations, depicting two unique homes in all their small details, firmly establish Alex’s place in both of them. Two Homes will help children – and parents – embrace even the most difficult of changes with an open and optimistic heart. Moving from a familiar home to a brand new one can be more overwhelming than exciting for young kids. A New House helps to make moving fun again with a lively activity book, geared towards 8-10-year-old kids. The book features games and puzzles to help kids understand the process of moving. I have fond memories during childhood of my parents bringing home empty boxes for us kids for us to make into our own dollhouses. It was a VERY happy day when my mom brought home discarded wallpaper sample books or old JC Penney catalogs. The wallpaper sample books were the perfect fodder for wallpapering our cardboard house walls and the catalog was a great source of glue on “home decor” like clocks, lamps, rugs, chairs and so much more. The supplies are delightfully simple…basically, everything I mentioned above plus glue, tape, and markers. Challenge your kids to unplug and make the cardboard condo of their dreams! 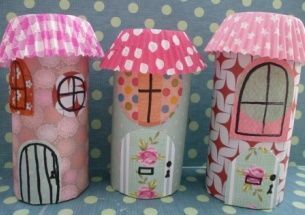 ArtsyCraftsyMom has a great tutorial on creating your own Paper Cup Village! Recreate your childhood memories with this Paper Cup Miniature Village craft – Fun, Frugal and so easy to make a town paper display with young kids. Don’t throw those empty toilet paper rolls away! Dress them up with cup wrapper roofs, felt and tissue paper! *Love diverse kids/YA books? So much that you’d like to review one for MCBD2019? Perfect, because we’d like to give you one! Book Reviewer signup is now open and as long as reviewers have the capability to post a review on a blog, Facebook (Pages only, no Profiles), Instagram, YouTube, and Amazon, they will be able to get a free diverse book for our celebration. GO HERE to sign up. *Our 2018/2019 Classroom Poverty Kit is ready for download! Our Poverty Doesn’t Discriminate: Understanding Poverty in America kit is ready to be downloaded and enjoyed by parents, librarians, and educators. Go HERE to download. REMINDER: We’d like to remind everyone of the 2019 date change (and future dates for MCBD as well). As always, this non-profit thanks you for helping us to continue our mission of getting diverse books into classrooms and the hands of young readers while also helping authors and publishers shine the spotlight on their work. 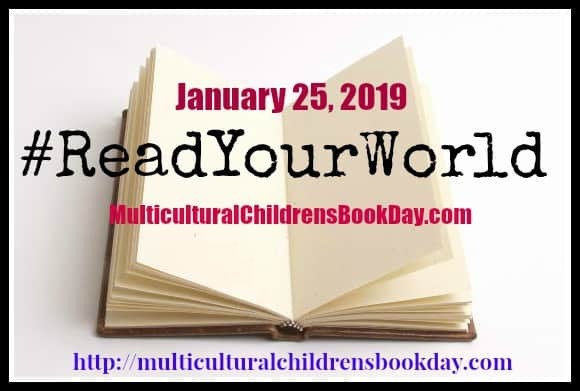 Follow our hashtag #ReadYourWorld on Twitter and Facebook for more news and updates.